The debate around the 2015-16 state budget is just gearing up, and — as always — the question of how much money is available will be critical to decisions about funding crucial public services and systems. For each of the three prior years, the Governor’s May revenue projections, which have been similar to his initial projections in January, underestimated revenues by several billion dollars compared to the final figures for the fiscal year. Meanwhile, as we noted a couple weeks ago, many of the public services that help working families climb the economic ladder remain undersupported even as the state’s revenues have surpassed their pre-recession levels and at a time when many Californians are still struggling to get by. 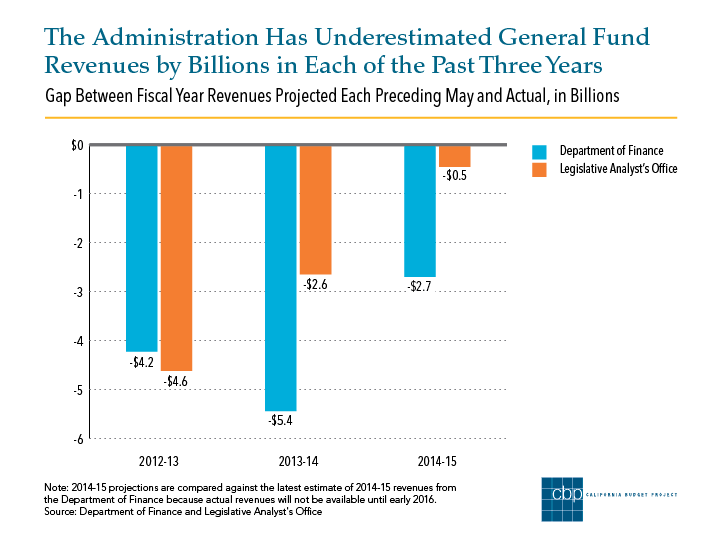 As the chart below shows, the Governor’s May projections were $4.2 billion below actual General Fund revenues for 2012-13 and $5.4 billion below the mark for 2013-14, according to data from the Department of Finance (DOF). Now halfway through 2014-15, the Governor’s projections from last May are $2.7 billion below the DOF’s latest revenue estimate for the current budget year. Of course, it’s reasonable to be cautious in projecting available resources, in case we hit a sudden economic downturn. However, being overly cautious when the economy is growing means potentially hobbling our own recovery by failing to commit sufficient resources to invest in California’s people and communities. This is like sitting on extra cash when you could be using it to learn new skills or pay for a much needed visit to the doctor’s office. The Legislative Analyst’s Office (LAO), which makes its own revenue projections each May, similarly has erred on the side of caution. Yet, over the past three years, the LAO has gotten progressively closer to the mark while the Administration’s projections have remained more pessimistic. By the end of 2014-15, the Administration’s May 2014 projection may be even further off the mark than it appears to be now. As the LAO pointed out in its response to the Governor’s proposed 2015-16 budget, tax revenues for 2014-15 will likely be higher than the Administration’s January 2015 estimate by $1 billion to $2 billion, and possibly even more, thanks to a strengthening economic recovery and a surge in revenue collections in December. To put these revenue figures in context, the University of California, which is in an open dispute with the Governor about its level of funding, asserts that state funding for educating students is still $460 million below its 2007-08 level despite increasing enrollment. In addition, annual funding for subsidized child care and preschool is more than $600 million lower — with nearly 97,000 fewer “slots” — than in 2007-08. Both the LAO and the Administration note that for 2014-15, higher-than-expected revenues would go to schools and community colleges under Proposition 98, the state’s constitutional minimum funding guarantee for K-14 education. However, given the complexity of Proposition 98 and how it interacts with changing economic circumstances, 2015-16 could well bring a different outcome, with General Fund revenues in the coming budget year freed up for other state priorities. For example, the amount of money coming from higher local property tax collections would make a difference for the state’s General Fund Proposition 98 spending in 2015-16. It’s not expected that state agencies nail their projections on the head. As Neils Bohr purportedly said, “Prediction is difficult, especially about the future.” But if there is reason to believe that state policymakers have room to do more to help Californians who the economic recovery has yet to reach, they should be doing that now. This entry was posted on Wednesday, January 21st, 2015 at 10:59 am and is filed under Governor Jerry Brown, revenue forecasts, revenues. You can follow any responses to this entry through the RSS 2.0 feed. Both comments and pings are currently closed.